The Flinders Ranges stretches for over 430 kilometres (270 miles), is the largest mountain range in South Australia and we couldn’t wait to explore this magnificent piece of the outback. There are very few sealed roads in the South Australian Outback and as we approached Marree at the northern end of the Flinders Ranges we were almost accustomed to the dust cloud we were leaving in our wake. An interesting little town, it was originally named Hergott Springs after a German botanist who travelled with the explorer John McDouall Stuart and the name was changed in World War 1 due to anti-German sentiment. 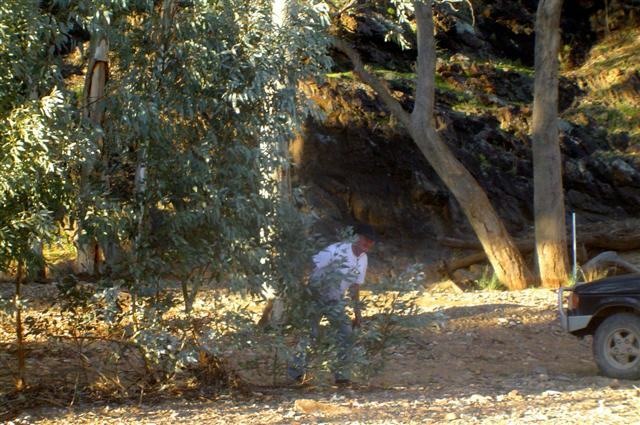 Today, its main claim to fame is the Marree Man. Approximately 60 kilometres (37 miles) from the town, this mysterious 4.2 kilometre (2½ miles) long image of an Aboriginal man was cut into the ground with a tractor or some other machinery. 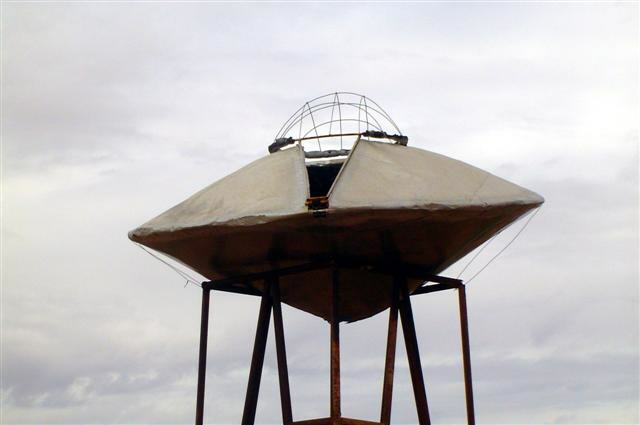 Discovered in 1998, the Marree Man was quite famous for a while, as no one would claim responsibility for it; perhaps it was aliens from outer space! There is a nice little park near the historic railway station and across the road from the “CBD”, one store that sold everything from groceries to fuel; I’m sure if you wanted to buy a tractor they could probably order it in for you! We decided to stop here for coffee but I wasn’t sure what I would find when I opened up the van; that red dust can get into anywhere! Luckily our picnic basket was on the back seat complete with thermos ”, the Oodnadatta and the Birdsville intersect. “Pioneers brought their sheep and cattle to the vastness of these Aboriginal lands before Marree was established. Drovers, cameleers, teamsters, and mailmen battled the track making development and even survival possible. Through their deeds the track became an Australian legend. 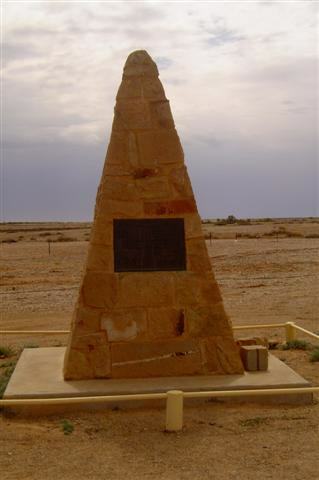 This cairn honours the people of the track and commemorates the centenary of Marree 1883-1983.” South Australian Tourism. The Birdsville Track was not in our plan for this trip but we drove along it for about 20 metres (65 feet) just so that we could say we’d been on it! From Marree it was on to Lyndhurst, some 78 kilometres (48 miles) down the still unsealed road. The Farina Ruin between Marree and Lyndhurst is an interesting stop. 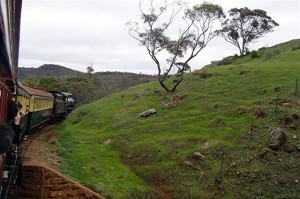 It had originally been part of the Old Ghan Railway. The building, falling down and looking like a demolition site, had been very well built back in the 1880’s. It had double brick walls and a fabulous design of handmade bricks. It’s a pity that some folks also think it’s a rubbish dumping ground; there were broken bottles and assorted rubbish lying around all over the place. The Old Ghan Railway Heritage Trail follows the path of the Old Ghan Railway throughout the South Australian outback and into the Northern Territory and at the Farina Ruin we learned a little of its history. It was originally called The Great Northern Railway and is a tribute to the pioneering spirit of those who endured this harsh land. It provided isolated residents with a link, both physical and emotional, to real civilisation. I couldn’t even begin to imagine what life was like way out here in those times; even today I think it would be hard. The railway line ran right through Farina and the remains of the “railway station” are the ruin here. We’ve been in small towns but . . . population 30? important as cattle were sent from here to Melbourne and much of the copper ore mined at Mt Freeling was also shipped east. I found Farina fascinating but we still had a little way to go and so were soon back on the road (track). By the time we reached Lyndhurst, and a sealed road, we were ready for lunch. Now it was time to look inside the van. Oh my! The dust was thick and it was such fine dust that it got into everything, even the fridge. We had to clean it up before we could have lunch. It didn’t take long, it’s not that big a van, but we were certainly hungry by the time we’d finished! 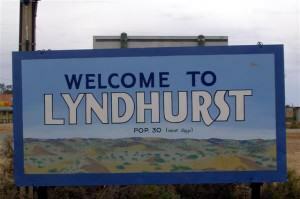 Lyndhurst is a quaint little town. It boasts a population of 30, most days (as the sign says), the Elsewhere Hotel (Welcome to Elsewhere), their own flying saucer, and Talc Alf. Talc Alf carves wonderful tablets from unprocessed talc. Each one is different, unique, and very beautiful and they tell the stories of the Dreamtime. 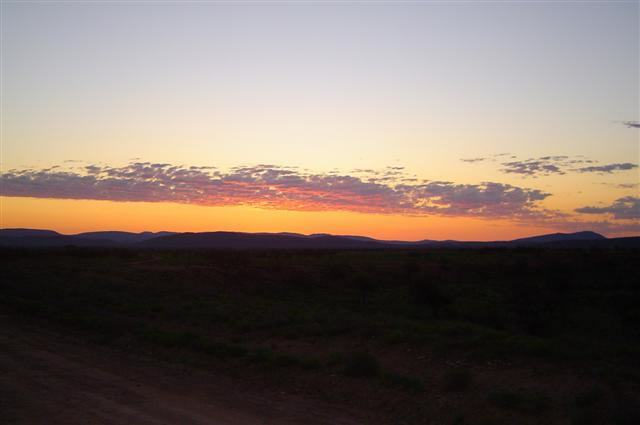 Alf’s place is 2 kilometres (1.2 miles) along the Strzelecki Track towards the outback town of Innamincka. So today we’d managed to travel on three of the Outback’s most famous tracks, the Oodnadatta, the Birdsville, and the Strzelecki; it made John’s day. There is an aboriginal site within Lyndhurst and a sign to explain the story. “Ngarngga Wami (Mundy Waters) meaning: beard or lichen bend. Two travelling mates from opposite groups camped near here one night, cleaned up and had a shave. They collected the shaved hair from the beards and placed it together on a rock. 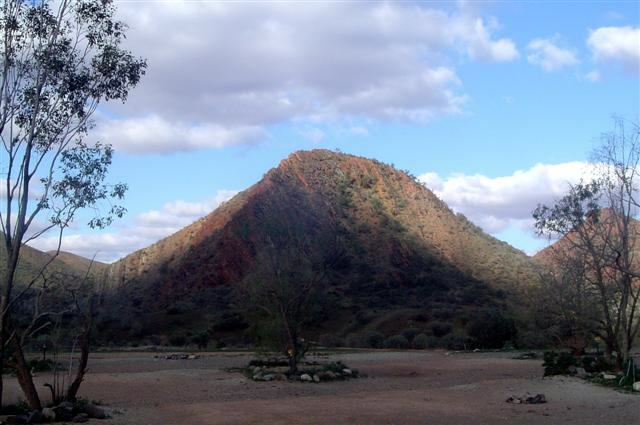 This name and associated Dreaming story belongs to the Adnyamathanha people (hills or rock people) who inhabit the Northern Flinders Ranges.” (South Australian Tourism). 28 kilometres (17 miles) south of Lyndhurst is the town of Copley. The vast metropolis of Copley (pop. 100) is the kind of town where you could walk from one end to the other in about 15 minutes and see all there is to see. 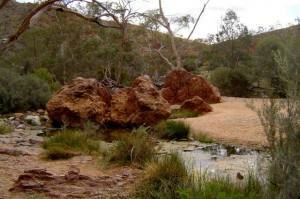 But it is the gateway to the Arkaroola Wilderness Sanctuary and the Vulkathanha-Gammon Ranges National Park. It is said that tourists have been known to travel hundreds of kilometres to visit the Quandong Café here and sample their famous quandong pie. Having never heard of a quandong, we decided to investigate. The quandong, we were reliably informed, is a bush peach and so we ordered some pie and a coffee and settled back prepared to have our taste buds tantalised. Well, it was . . . different, not quite sour and not quite sweet but interesting. I think it’s very much an acquired taste and not one that I care to acquire. John, however, quite enjoyed it. We still had 130 kilometres (81 miles), and that’s 130 kilometres of unsealed road, to travel that day and so we didn’t linger in Copley. We finished our coffee and pie and were back on the road to Arkaroola. 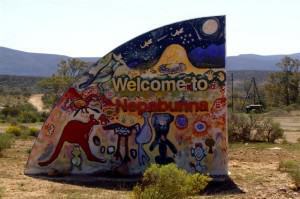 Along the road we passed through Iga Warta and Nepabunna, two Aboriginal communities. Both communities have some terrific murals painted by local indigenous artists, particularly their “Welcome” and “Farewell” signs. There were also several sheep and cattle stations dotted throughout the area and we passed some along the way before we reached the Gammon Ranges National Park. 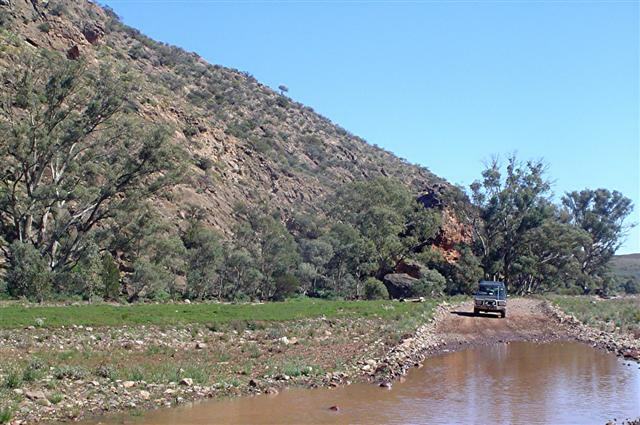 This park is on the doorstep of Arkaroola; in fact you have to drive through the park to get to Arkaroola this way. We crossed several creeks on our way through, although it could have been the same creek many times, and finally reached the Arkaroola-Mt Painter Wilderness Sanctuary in the early afternoon. A further 15 minutes later we were at Arkaroola Village ([star][star][star][star]). 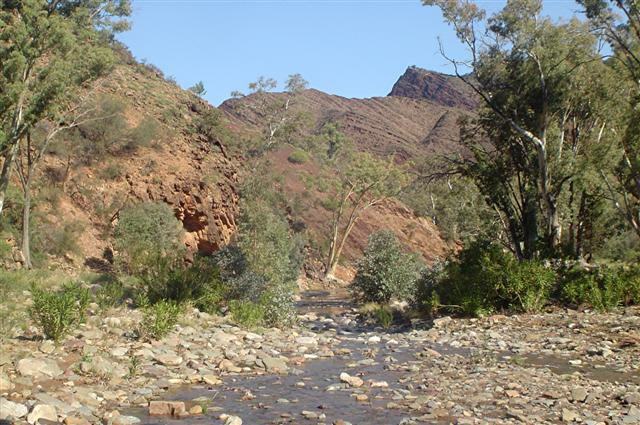 Arkaroola Wilderness Sanctuary, owned and operated by the Sprigg family, is the must-see location of the Northern Flinders Ranges and South Australia’s premier eco-tourism destination. The publicity describes it as “breathtaking by day, dazzling by night” and what a fabulous place it is! 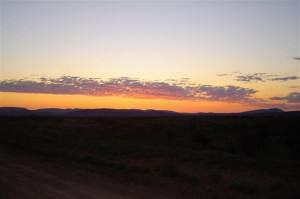 In the 1960’s Reg and Griselda Sprigg bought a 610 square kilometre (235 square mile) property in the northern Flinders Ranges and set about returning the land to its natural state. 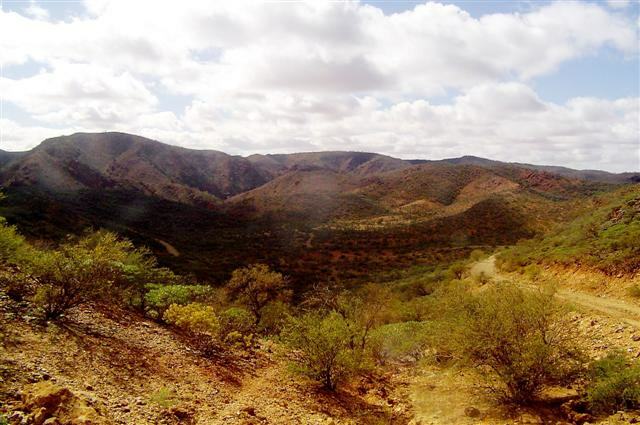 The result is the Arkaroola Wilderness Sanctuary and it features some of the most spectacular views in the country. After our camp was organised we went for a wander out to the Pinnacles, an outstanding feature of the Mawson Valley. Erosion has exposed their granite core and today they are mere shadows of the mighty outcroppings they once were. 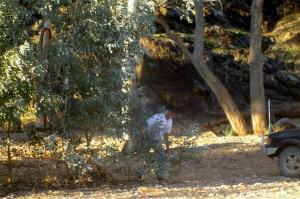 From the Pinnacles we went on to the scenic waterhole at Bolla Bollana Springs where I caught a “bunyip” on camera. Of course, this was after said “bunyip” had tried to take over the navigator’s job and got us very lost! A bunyip is a mythical creature a la Bigfoot or the Abominable Snowman. The sun was starting its downward journey as we made our way back to camp. Our Astronomy Tour that evening would begin with a briefing at 6:00 at the Visitors Centre and having already been lost once this day we didn’t want to risk it again. Especially with night falling. There was only one other couple in the group for our briefing and our tour guide, Wayne, gave us a very brief lesson in astronomy so that we would understand what we were going to see that night. After the briefing we returned to camp for dinner and then met back at reception a little before 8:00 for our trip up to the Observatory. What a night! For the next hour and a half we looked at stars, nebulas, and globular clusters, learned how to find the celestial south, saw Jupiter and 4 of her moons, and, finally, our own moon. That is, when Wayne remembered that I was there. It was so dark that he couldn’t see me and if I didn’t speak out I would have been forgotten entirely! Not impressed! Outside the Observatory Wayne pinpointed the positions of each object we had seen, in the night sky. It wasn’t terribly different to what we’d seen at the Cosmos Centre in Charleville but I, for one, didn’t care. I also didn’t want to leave, but, all good things . . ., as they say. Returning to camp we settled down in the balmy, if windy, evening and listened to the soft night sounds while we sipped a glass of white wine. But it wasn’t long before we were lulled by the gentle sounds and soon were in bed; it had been a long and very busy day. We had a late start the next morning and we discovered that the previous day’s heat had dissipated in strong, cold winds. We took our time over cups of tea and a leisurely breakfast while listening to fellow campers and caravanners packing up to leave or just going on day trips. In fact, quite a lot had left early, long before we saw the light of day. That afternoon we went up to the reception area for our Ridgetop Tour, 4½ hours of adrenalin pumping, body bruising, hair-raising adventure. 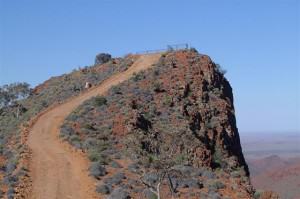 This is Arkaroola’s signature tour to the famed Sillers Lookout and something we simply had to do. Our guide turned out to be Wayne again and I hoped he wasn’t going to get into the habit of forgetting me; I wanted to see Sillers Lookout, not spend the night there! belts and hang on! The wind was blowing hard and we hadn’t gone 100 metres (328 feet) before one of our fellow passengers lost his hat. The wind just took it and away it went! Our first stop was at Coulthard Lookout where there are two viewing platforms, but one is never used because it is unstable. In spite of the freezing wind that threatened to blow us over the side we listened as the driver from the other car told us about some of the features we could see. One of them was Lake Frome in the distance and another was Griselda Hill, which is a huge hill in front of reception. The story goes that Griselda Sprigg was unhappy that old Reg hadn’t named a mountain for her and when she complained about it he told her that if she climbed one, he’d name it for her. So she did. Albeit by the easiest route but she climbed it nevertheless! You go girl! We’d passed Dinnertime Hill where, in the old days, the men knew that they could be home by dinnertime from this point and we also saw quite a lot of Euro’s along the track. They resemble kangaroos except that they have long shaggy coats, longer ears, and shorter tails; they’re just as cute though. A wedge-tailed eagle soared majestically above us. Along this part of the track there is a cairn, a memorial to the late Reg Sprigg, the man responsible for Arkaroola. 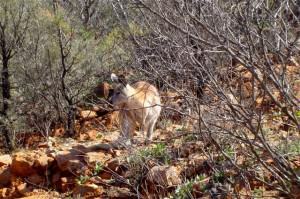 In 1969 he succeeded in having Arkaroola gazetted as a wildlife sanctuary and then in 1970, an historic reserve. Today, the sanctuary is privately owned by the Sprigg family. After thumping and banging our way along the track, with some very steep parts, both up and down, and skirting the back of Mt Painter, we reached our second stop, Split Rock, where we could see across Freeling Heights to the magnificent Mt Ward. And still the wind howled. Onward and upward we bounced our way further along until we came to the piece de resistance, Sillers Lookout. We paused briefly at the base, I think for effect. And, believe me, it had the desired effect! With my arms wrapped tightly around John and my eyes firmly closed we began our climb to the Pinnacle, the highest point we would reach today, some 750 metres above sea level. It was only when John said in a low voice, “We’re there, love” that I opened my eyes and what a sight! It was the most magnificent 360° view of the Northern Flinders Ranges. We could again see Lake Frome, one of South Australia’s largest salt lakes, in the distance. We could also see across the Yudnamutana Gorge to Freeling Heights and out over the Paralana Hot Springs! John said it was worth the trip just to see me speechless. He’s going to turn the car around? Up here? The spectacular “Ridge-top Road” culminating at Sillers Lookout was constructed by Exoil NL in 1969 to facilitate uranium exploration in these high ranges. 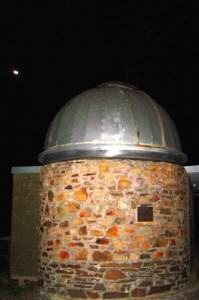 On August 15th 1970 the Honourable Don Dunstan, Premier of South Australia, carried the first rocks to construct this cairn to support the cartographic plinthe indicating principal points of interest. Reg and Griselda Sprigg, Arkaroola. The ride down was worse! Afternoon tea was supplied but because of the icy wind our steaming hot cup of coffee was iced coffee within seconds. And yes, Wayne forgot me again! What am I, invisible? I forgave him, however, because of his excellent commentary along the way and he was quite apologetic. But then it was time to begin our trek back. Coming down from Sillers Lookout was just as awesome as going up but this time my eyes were open even if I was holding my breath. The wind continued to blow and it was almost arctic! One of the other passengers dug out some blankets from a box under the seat and we wasted no time wrapping ourselves in them. Several times on the way back Wayne stopped to give us some examples and some samples of the native flora. We saw the curry bush, native rosemary, and lemongrass, bush bananas, bush oranges, elegant wattle, and mungo brush. We arrived back at reception at about 5:30 and I couldn’t wait to get back to our van. Sweats and ugg boots, the heater on, and a glass of red, a top way to end what had been a fantastic experience! Of course it would have been better without the wind but that’s something we had no control over and gives us an excuse to come back and do it again sometime! The next day we decided on our own tour of Arkaroola. First stop was the rock formation known as Jaspers Twins, two massive outcrops, one on each side of the road. And then it was on to the Welcome Mine. I’m not sure what was mined here but it had been abandoned a long time ago. Just after the mine was Welcome Pound, a magnificent view of the entire valley. Up and down some really steep hills we soon came to Barraranna Gorge and its dry creek bed, and a little further along, Stubbs Waterhole, also dry. Entering Claudes Pass there were a few more steep climbs and descents and here the road narrowed and became winding in parts. Paralana Hot Springs, definitely NOT for swimming in! “The geothermal waters of Paralana Hot Springs issue from major earth crustal fractures in this vicinity that date back one billion years. These geological faults, which once poured forth large quantities of lava, now facilitate continual geological movement of the surrounding mountain region. These waters are heated by hot rock at shallow depths and by radioactive mineral decay. Carbon dioxide, nitrogen, radon gas, and helium bubble forth continuously. Because Paralana Springs contain small amounts of naturally occurring radioactive elements, swimming in or drinking the water constitutes a health hazard.” Arkaroola Wilderness Sanctuary. “Vadaardlanha meaning Dead Finish Fire (Dead finish is the plant species Acacia tetragonaphylla). Two mates of opposite groups were travelling together. 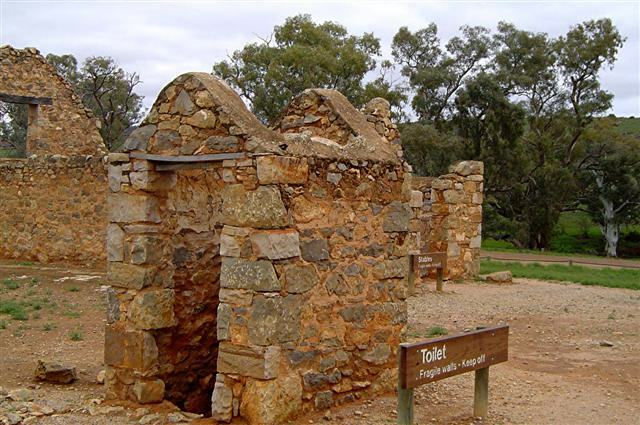 One doused his dead finish firestick into the spring, which remains bubbling with hot water to this day.” South Australian Tourism. Neither John nor I felt comfortable there so we left very soon after arriving and stopped a couple of kilometres down the road in a dry creek bed for lunch, sat back in our chairs and waved at the few cars that were heading for the springs while we ate. We made a quick return to camp because there are no restroom facilities at all between the village and Paralana, and then it was back out to try the Station Back Road. Now this is an interesting track and has its moments with many steep inclines. The track winds around the back of the campground, past the local rubbish dumping ground, and back into the caravan park. It only took about an hour to complete the circuit and unfortunately, we were left with a feeling of “Is that all there is?” And so it was time to start packing up our camp for we were moving on the next morning to the Southern Flinders Ranges. Our visit to Arkaroola has been fantastic and these few days will stay with us for a long time. The caravan park had plenty of room; even in peak times there would be no problem getting a site and the amenities are clean and modern. And we could ask for nothing more. Then again, it would have been better if the wind had died down a little. The sun was shining when we left the next morning and it was an absolutely glorious day. But, wouldn’t you know it, there was no wind! Seriously, the wind dropped overnight. I couldn’t believe it. We’d already decided on one night at Leigh Creek before heading south and so we bounced our way long the unsealed and dusty road for the 130 kilometres (81 miles) back to the main (sealed) road. Leigh Creek is 6 kilometres (4 miles) south of the junction and we arrived at the town’s only caravan park, Leigh Creek Caravan Park ([star][star_half]) at a little after 1:00. The amenities were not what we’d come to expect, in fact there was precious little privacy to be had, but we’re only staying one night. Leigh Creek is a coal mining town in the north of South Australia on the edge of the Simpson Desert. The original town sits 13 kilometres (8 miles) to the north. It was moved in 1982 when it was discovered that it was located on an important coal seam. 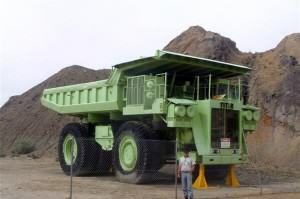 The Leigh Creek Coalfield runs escorted tours and I thought it might be interesting. Unfortunately there were no tours that day. However, we did visit the mine and were astounded by what we saw. I had never seen a mine so large; it was truly amazing. The photos we took don’t really convey the size of it. It was huge and, if truth be told, a great big ugly scar on the landscape. This field produces the coal that accounts for 40% of the electricity in the state of South Australia. That is a considerable amount and the coal trains from here are supposed to be the longest in the world. We walked around the display for a little over an hour and John was fascinated with the size of the trucks. I actually sat inside one of the wheels! There is only so much to see at a coal mine and we were soon off to find other places to explore in our time here. Aroona Dam, which turned out to be a pretty spot with picnic tables and barbecues is one such place. We even saw a flock of emus. The area for 40 square kilometres (15 square miles) around the dam was declared a sanctuary in 1995. The Aroona Sanctuary has amazingly diverse landscapes from wetlands to saltbush, rangelands, and rocky outcrops. There is a 5.5 kilometre (3½ mile) walking trail through the sanctuary and we drove down to the start of it but given the lateness of the day we decided not to go any further. When we arrived back at camp one of those coal trains was rumbling slowly past. It was never-ending; at 161 coal trucks,(yes, we counted it!) and 2.8 kilometres (1.7 miles) long, they really are the longest in the world! It just went on and on. And a few more travellers had arrived; a group of 7 families camping together had, what appeared to be, about a hundred kids! It reminded us of home with all our children and grandchildren . . . only louder! 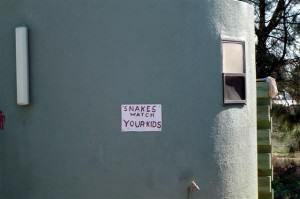 sign on the building that read “Snakes: Watch your kids!” didn’t inspire confidence! Nice clean facilities but I kept looking for unwanted guests and couldn’t wait to leave! We arrived in Hawker in the Southern Flinders Ranges a little more than 2 hours after leaving Leigh Creek and checked into The Flinders Ranges Caravan Park ([star][star][star][star]). This park is almost like a little village and our ensuite site is perfect. Drinking water is rainwater from the tank and we can’t drink the tap water but that’s the only minus. We set about organising our camp and as we intended to stay here for about a week, we set up the annex as well. Might as well have the extra room. Some pretty ominous looking clouds had been building up while we were doing this and we’d almost finished when the rain started. It wasn’t too bad, at first, but later in the evening the rain became heavier, much heavier. Not good! Well, the rain bucketed down and just after midnight it was almost torrential and it continued without pause until after 8:00 in the morning. We found a local radio station to listen to news and weather reports while we were having breakfast and they reported that over 50 millimetres or 2” of rain had fallen in 8 hours overnight and all unsealed roads in the area were closed, including the road from Marree. Later in the morning we drove into town to visit the tourist information centre and basically to just have a look around. Hawker is a terrific place as a base to see the Southern Flinders Ranges as it is pretty much central to everywhere. 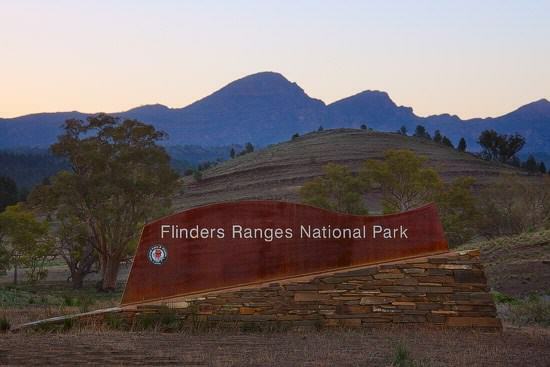 In fact the town promotes itself as “The Hub of the Flinders Ranges”. Named after George Hawker, a one time Speaker of the House in the South Australian parliament, it was established in 1880 and was an important rail centre from 1881 until 1970. We drove around the streets for a while looking at some of the houses here; the architecture is very old style, as you would expect, and quaintly typical of outback towns. There’s even a house made of pressed metal and corrugated iron. the fellow at the desk. He gave us some brochures and directions and also advised us that most of the scenic places would be closed today because of the road conditions but that once the rain stopped they would open pretty quickly. Now all we needed was for the rain to stop! But the afternoon stretched ahead of us. The rain had eased and patches of blue sky were beginning to appear in the distance. 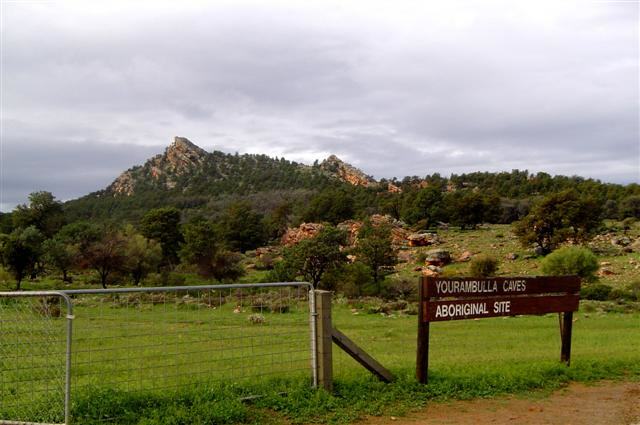 We thought we might like to see the Aboriginal cave drawings at Yourambulla Caves, 11 kilometres (7 miles) south of Hawker. The caves are reached via a dirt (should I say mud?) road that surprisingly was still open. However, once on the road it was hang on and pray we didn’t get stuck! The mud was shockingly thick and unbelievably slippery. Obviously several other cars had been through before us and had churned the road to a quagmire and a slight upward incline made it even more interesting. John put the differential lock on and off we went; there was no turning back now and eventually we got through. How, I don’t know, but the car was positively caked with thick brown mud. We parked the car in the parking area and set off on foot. It was a steep uphill climb along a muddy and rocky walking track. Water flowed down the track in places and the mud was sticky. Did I really want to see the caves? Whatever was I thinking! But we persevered and after some 40 minutes reached the first cave where scaffolding had been erected and a sign proclaimed that the site was closed for restoration. After climbing all that way we were less than impressed but we pressed on towards the other two sites. In a short while the going became too difficult especially when the beaten track ended and we could only go from one signpost to the next. John is more agile than I so I waited while he pressed on a little further. Eventually he came to the next site, which was no better than the first. It was time to call it quits and begin the trek back to the car. You would have thought that walking downhill would have been better but with the ground wet and slippery it was slow going. At least the rain had stopped completely by the time we reached the bottom and the clouds had cleared a little. Negotiating that road again was not something to look forward to but, at least, this time it was on a downhill slope. Since we’d arrived another carload of tourists had braved that bog; they’d managed to get through but had churned up the mud even more. And to make matters worse they’d parked very close to us, which made manoeuvring in the slippery parking lot a whole new experience. It was a case of grit our teeth and just do it! The amount of mud caked onto the car must have just about doubled the weight of it and John surely felt like he had no power steering but we both released the breaths we’d been holding when, finally, we were out onto the blacktop once more! All in all it was not one of our better afternoons. The only saving grace was the magnificent view from the top and the much-needed exercise. And back at camp John would spend the next hour attempting to hose the mud off the car. It proved to be an almost impossible task. Port Augusta and Quorn since the 1870s. 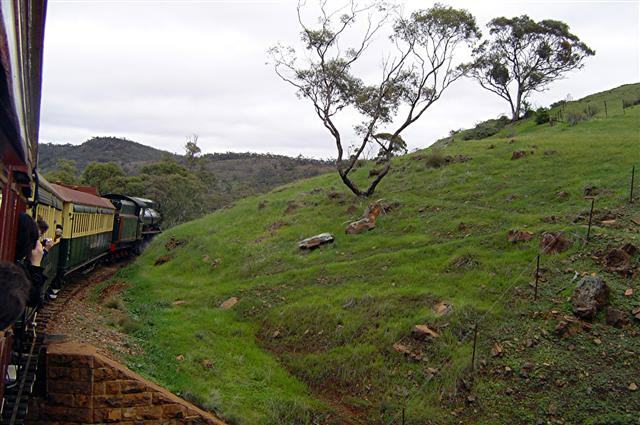 Pichi Richi Railway is the last remaining operating section of the Old Ghan Railway and some of the carriages used on the train are 120 years old. Quorn was established in 1879 when the railway line was opened. Eventually it became the junction of the Sydney-Perth and Adelaide-Darwin railway systems and would stay so for a hundred years. We were early for our ride on the steam train and so we drove around to the Railway Museum, which unfortunately is closed on Sundays, much to our disappointment. But we did see the train leave its shed for the short journey to Quorn Railway Station. In fact I stood on the tracks to get a photo. I didn’t even get so much as a shake of the head from the fellow driving the train so I gathered that I wasn’t the first person to do this. Back at the station we had to wait while the steam engine was coupled to its carriages before we boarded and then we were on our way. 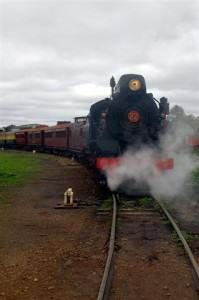 We departed Quorn Railway Station at 10:30, on time, almost, for the Pichi Richi Explorer trip through Pichi Richi Pass and on to Woolshed Flat for a lunch break. On the way we passed through some truly amazing countryside; over old wooden bridges that you wonder could support the weight of the train, and past some spectacular mountains. Our conductor, George, was not only very knowledgeable but also highly entertaining; he kept us laughing all the way! They were a merry bunch of folks aboard the train and they were all just as anxious as we were for some great photos; there was a lot of good-natured jostling for prime spots and, in most of the photos you can see a lot of cameras out the windows! At Woolshed Flat, where we stopped for 45 minutes, lunch was almost a disaster. The gas had gone out on the oven and everything was cold. While we waited for them to get the oven going again there was plenty to see. This is actually the end of the line for this section of track and the track loops around to come back to the head of the pass. We watched while the engine was uncoupled from the carriages and then it travelled around the loop before reversing up to be re-coupled at the other end of the train. We walked along the tracks back up towards the pass but then the call went out that lunch was ready and, along with everyone else, we headed back to the euphemistically named dining car for a taste of the famous “Quornish Pasties”. And they were, without doubt, the best Cornish pasties anywhere. Well worth the wait! but we just kept snapping away; everything was worthy of a photograph, especially the mountain called Devils Peak that actually looks like a face. We’d missed it on the way out because we’d been on the wrong side of the train. It was still early afternoon when we arrived back at Quorn and so we decided to take our time returning to camp and do a little sightseeing. We stopped to photograph some ruins and then walked the trail to Death Rock at the Kanyaka Waterhole, 26.5 kilometres (16½ miles) south of Hawker. This permanent waterhole is steeped in Aboriginal history because of its very permanence; it became an important campsite. Death Rock is a 7-metre (23-foot) high quartzite rock beside the waterhole. A few hundred metres further on we stopped at the Kanyaka Homestead Historic Site. It’s fascinating with its overseer’s quarters and stables, woolshed and shearer’s quarters, just to name a few of the buildings. So much history here but one particular building caught John’s attention and a photo was definitely the order of the day: presenting the historical outhouse! 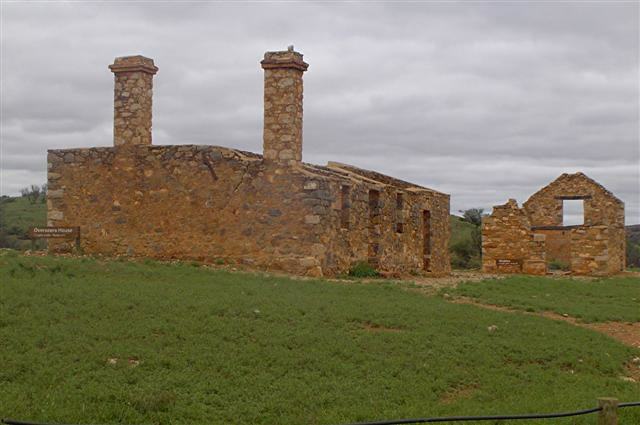 The homestead was built by a John Phillips in the mid-1850s and in the best years the pastoral lease covered some 945 kilometres2 (365 miles2 ) and the station carried over 50,000 sheep. At least half the sheep were lost in a devastating drought of 1864 -1867 and even though Phillips tried to keep going he was finally forced to abandon the homestead in 1888. The site is now on the register of State Heritage Items. Further up the road from there are the ruins of the historical village of Wilson. How could we not stop there! And a tour of the cemetery where the graves date back to 1888 was absolutely fascinating. Life was pretty hard back then; the average age on the headstones was 30.The sun was well and truly on its downward path when we left the cemetery and by the time we arrived back at camp the overcast skies had become more so and the temperature had dropped even further. It looked like being the kind of night where one rugged up and stayed indoors. Pound now unless you’re into a lot of walking. And I mean, a lot! We enjoy walking and if the trek had been an hour or even 2 we would have seriously considered it. But a 9-hour return walk was not something I really wanted to do at that time. Our flight was booked for 11:00 and we arrived at the information centre a little before 10:30 to collect our tickets before driving out to the airstrip where we met with our pilot, Kim. Our plane was a Cessna 182 single engine and we were given a few safety instructions before climbing aboard, John in front and me in the back. plane. Kim did say that for professional photographers they usually take the door off but I told him that I like the door exactly where it is, thank you very much! The view, however, was stupendous! 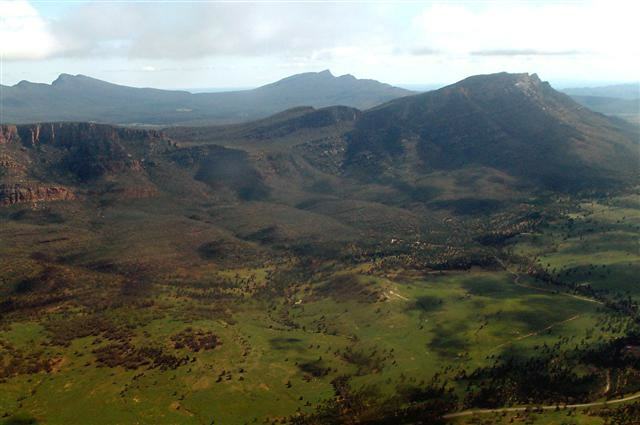 What a jaw-dropping sight Wilpena Pound is from the air! 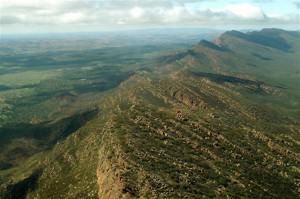 “Wilpena Pound is a natural landform, shaped by weathering and uplifting. 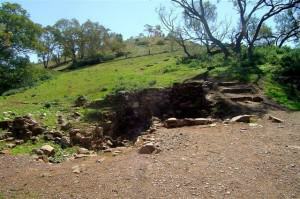 The product of erosion over time, Wilpena Pound is the remnant valley surrounded by much higher mountains. The shallow basin shape of Wilpena Pound is the result of rock layers being squeezed from several different directions. This action produced a series of domes and basins in the rock layers. The structure of the Pound, so called because it formed a natural enclosure, is obvious because the softer rock layers within have been worn away, leaving a basin-shape of hard quartzite at the surface.” National Parks and Wildlife Service. Wilpena Pound, including the ranges, is 17 kilometres (10½ miles) long and 8 kilometres (5 miles) wide and covers 100 kilometres2 (39 miles2). The floor, which is level, is 8 kilometres (5 miles) long and 4 kilometres (2½ miles) wide. Our flight took us over Arkaba Station, a working sheep station, the Elder and Heysen Ranges, each with some truly majestic peaks, Edeowie, Bunyeroo, and Brachina Gorges, where the road looked like a long brown finger as it snaked its way through the gorges, and the ABC Range, known as the Backbone of the Flinders because of its resemblance to the backbone of an animal, a rather large one, I’d say! The ABC Range was so named because there were, supposedly, 26 peaks in this range. But, recently some enterprising fellow actually counted them and found there are 34. I’d say he has way too much time on his hands! However, the name has been accepted for so long that it was pointless to try and change it. After that we flew over St Mary Peak, the highest mountain in the Southern Flinders at 1171 metres (3842 feet) high and from there it was over the Pound Gap. In the distance we could see Lake Torrens, that huge salt lake we’d visited whilst at Andamooka. Breathtaking, jaw-dropping, awe-inspiring! Even those descriptions, apt as they may be, don’t do justice to it all. You have to see it and even then it’s hard to believe! We’re going to land on THAT? We’re landing where? On that dinner table? In what seemed record time, our 30 minutes was up and we were coming in for a landing. There had been a little turbulence and for the last 10 minutes my stomach had felt like it was in my throat. I remembered the immortal words of American astronaut, Alan Shepard as he was about to be launched into space for the first time, and rearranged them into my own prayer: “Please, Lord, don’t let me throw up!” And seeing the landing strip from the air was worse! I could not believe that our pilot was going to land on THAT! My dinner table is bigger! But as soon as we were on the ground again, I was fine. John, of course, never had a problem; he never does which can be quite infuriating at times! The landing had also been very smooth for which I was grateful; this was, after all, my first time in a light aircraft and, yes, he did manage to land it on that dinner table! We thanked Kim for the flight, and his excellent commentary, and headed back to the information centre for a much-needed cup of coffee. Still on a high from our flight, the caffeine fix was perhaps something we didn’t need but we didn’t care. Leaving the centre we drove back to Hawker making a few photo stops along the way. This scenery is amazing and I wanted to photograph everything. 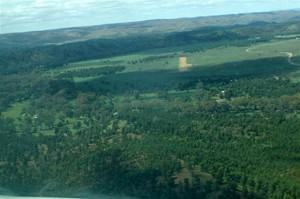 When you hear about the Outback you don’t imagine that it could be so green but recent rains had turned our dry, red land to a most beautiful, green paradise. This afternoon we took the Moralana scenic drive through a couple of sheep stations, Arkaba being one, and some bush camping areas, and out to Black Gap. A stunning 28 kilometres (17 miles) of mountains, creeks, some surprisingly dry after all the rain, and green, green fields filled with trees and sheep. And wildflowers. Usually at this time of the year the whole area is awash with colour from the wildflowers but, until recently, there’d been no rain to speak of and so the flowers were a little late blooming. The skies stayed clear for the rest of the day and into the evening heralding another cold night and the wind had picked up again. But as long as the rain stayed away, we didn’t care. 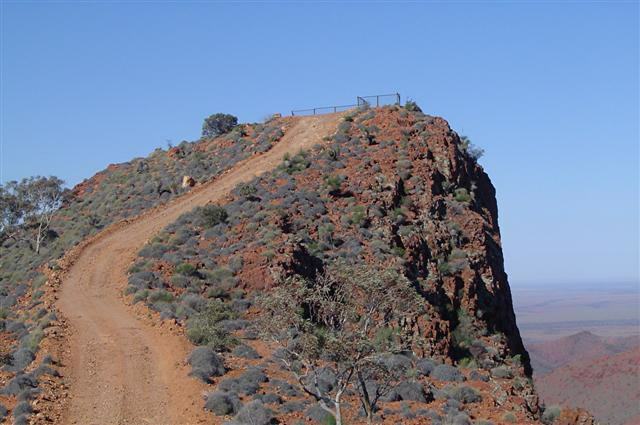 up the Hawker-Leigh Creek road for about 60 kilometres (37 miles) and turned off onto the Brachina Gorge Geological Trail. 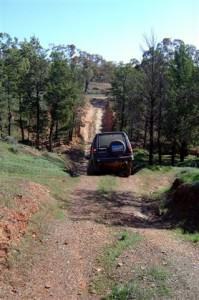 The sign proclaiming “4wd access only” didn’t deter us at all. Heading into the gorge, the mountains rose on either side of the road; one could almost have felt like being hemmed in except that it was so beautiful. The creeks had been dry for months but the recent rain meant that many of them had water in them, sometimes quite a lot of water. We crossed several creeks, both with and without water flowing and the surrounding countryside was green with a few wildflowers here and there. There are a lot of caves in the gorges. They’re not very deep but I’m not in to exploring them, not in the slightest! We stopped briefly at the Teamsters campground, a bush camping area with toilets, fireplaces and rainwater tanks for drinking water. There was even parking for large vehicles. Generally, bush camping areas have only toilet facilities, and rough ones at that, so this was quite a surprise. Continuing along the track through the gorge we marvelled at the wonderful scenery all around us. The sun was reflecting off the water in the creeks and some of the rock faces had tufts of green vegetation along them. We soon came to an area of what appeared to be a wall of red shale with a creek running along the base of it. It was so peaceful that we decided to stop here for coffee. However, jumping out of the car with no jacket on was a bad move! It might have been sunny but that wind was freezing! Coffee break over we continued our way through to the end of this gorge and into the Aroona Valley where there were a couple more campgrounds. The Heysen Range, named after Sir Hans Heysen (1877-1968), one of the first Australian painters to capture the very dry Australian light, overlooks the Aroona Valley. We walked around the Aroona Ruins, a homestead that had been owned by a pastoralist named John Hayward. It seems that in 1854 the pastoralist had commissioned one John Wilson, a ship’s carpenter, to build this homestead. Well, of course, my John was quite chuffed at this, being a pine furniture manufacturer when not travelling and having the last name of Wilson. Could it be that this is an esteemed ancestor? Is working with wood in the blood? Something to look into when we get home. 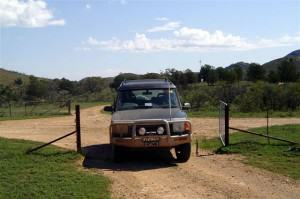 The Koolaman Campground in the Aroona Valley has two separate camping areas; one can be reached by 4×4 vehicle only. We didn’t drive down to have a look although John would have liked to; from the start of the track it was easy to see why it was 4×4 only. In the other area there is a rather interesting creek bank where the bank had eroded away; it looked like a big, open mouth. Travelling along the road to Blinman we passed the mountain range called The Great Wall of China. This range has a row of rocks across the top resembling a wall. Blinman, South Australia’s highest town, was our lunch stop in a small parking area near the ruin of a miner’s cottage. There are some fabulous old houses in this town but it is definitely 4×4 territory; we didn’t see any other sort of vehicle at all. A walk up the hill to the old mine after lunch led us to the climb to the top of the mine. The town is named after a one-legged shepherd named Robert “Peg-Leg” Blinman who discovered copper in this area in 1859. In the following decade thousands of tonnes of copper was removed from the mine which is now a historic reserve. But the day was moving on and after a brief look at the mine we continued on our way. The road into the Parachilna Gorge looked to be pretty ordinary but after about 10 kilometres (6 miles) that changed and it really is stunning. The trail took us to Angorichina Village, a tourist park, for a very brief stop and then once more we were on our way. The gorges here in the ranges are spectacular with an incredible variety of plant and animal life. Euro’s, the kangaroo’s smaller cousin, were everywhere and although generally timid where people are concerned these ones seemed to be quite comfortable with vehicles passing by. 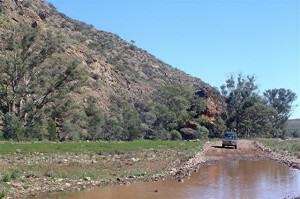 Leaving the gorges behind, we reached the Hawker-Leigh Creek Road once more at the famous town of Parachilna. The population can be counted on the fingers of one hand but this town does attract the rich and famous. A growing number of Hollywood’s elite are attracted to this stunningly beautiful landscape. Some of the famous visitors include actors Kate Winslett and Harvey Keitel and Hollywood director Phillip Noyce. The Prairie Hotel at Parachilna is reputed to have the best local fare anywhere around these parts. It was a little too early for dinner but we did want a snack and we settled for ice cream cones. Now, these were a little different. We had prickly pear ice cream. We know what a prickly pear is, it’s a kind of cactus plant, but . . . ice cream? Well, once I’d had my first taste I was hooked. Never had I tasted an ice cream so good! By the time we were back at camp it was getting dark and John wanted an early night; we had a big day planned the next day and it certainly promised to be interesting. Little did we know how interesting it would be! The Worumba Experience was something that John, especially, really wanted to do and so we set off early for Worumba Station, 30 kilometres (18 miles) east of Hawker. 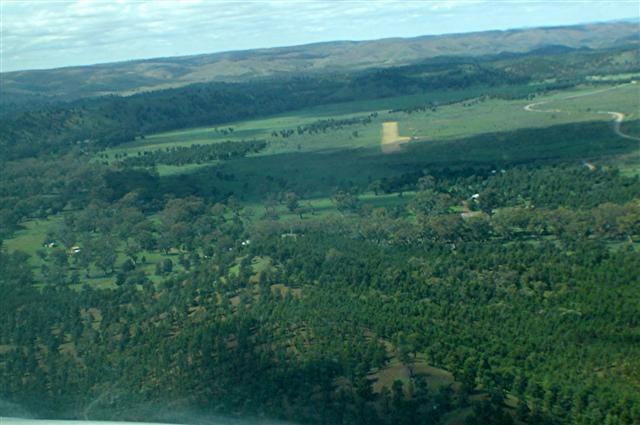 Set amidst rolling hills of spinifex and encircling Mt Plantagenet and Mt Craig, Worumba Station is 19,425 hectares (48,000 acres) and 170 square kilometres (65.5 square miles) of awesome beauty. The road into Worumba crosses Willow Plains and takes you past the ruins of historic homesteads dating back to the late 1800’s, and through Willow Creek Gorge before you come to the Worumba boundary gate. we visited Worumba’s own art gallery where there are some delightful landscapes by artist-in-residence Mary Clock-Clarke. Her paintings are marvellously detailed and, of course, all original. And she’s also a mine of information when it comes to the history or geography of the area. But we were here for the “Worumba Experience”, a low range, 36-kilometre (22-mile) self-drive 4×4 excursion around the property. I would have been happy to stay and chat with Mary but John wanted to get going. Maps and detailed instructions were provided and off we went. The track is well signposted and when we started the House Paddock was empty. Generally there are some sheep in there but the shearing had been finished only the week before. At the Station Paddock Lookout the hills rolled on into the distance and a few euros were feeding in the grass. The homestead was just below us and over the top of it we could see Devil’s Peak at Quorn. Further on, near Willow Creek, we passed cattle grazing by the side of the road, stopped to photograph a friendly shingle-back lizard, and then paused briefly at Eagle Hawk Dam. The road so far had been good, unsealed but well looked after and I was beginning to think that this 4×4 track wasn’t going to be much at all. the seat belts, low gear, and hang on all the way now! In Golden Wattle Gorge the trees were just starting to bloom; in a few weeks they would be a riot of colour. And the track was getting rougher with each metre! Our next stop was the Yacca Lookout. This is the highest point along the route and the view from here was magnificent! Not to mention Mt Plantagenet and the walls of Wilpena Pound! 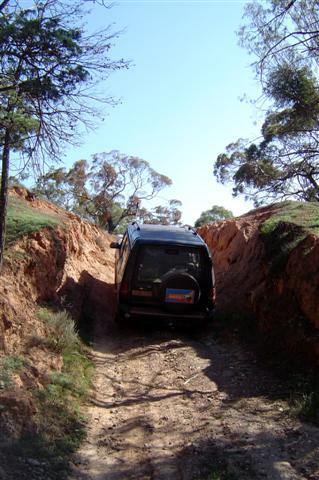 We continued on our way through the pine forest and into mallee and pine woodlands, through a semi-permanent spring, and into the creek bed known as Mary’s Folly. That’s a particularly steep descent into the creek bed followed by an equally steep ascent out of it. And that proved to be the hardest part of this track. After that we had a brief, if much-needed stop at Finlay’s Lookout before driving into the dry creek bed of Mt Craig Creek and following it through to Willow Creek and Willow Waters Gorge Road that brought us to the end of the first section of track. The second section of the track is new and we’d been invited to give it a try even though no tourists had ever been on it. And when it comes to off-road tracks, John never needs to be told twice! This is the one for the off-road enthusiasts. The path is not very well defined . . . yet; it needs a little more traffic along it, and in parts the road disappears altogether. Into and through creek beds, over rocks, and finally we followed what we thought was the track only to discover at the top of a particularly steep climb that we were perched on the top of a mountain with nowhere to go! John got out of the car and wandered around to see if he could find a way down but the only way was where we’d come up. Negotiating this one was interesting! How he managed to turn the car around in that small space is totally beyond me – I had my eyes closed. When I finally had a look at the “road” down I became worried – it didn’t look that steep on the way up! Very slowly we edged our way down and it seemed to take forever but finally we were at the bottom and both breathed a sigh of relief. The light was fading but we walked around until we found the right track and bounced and thudded our way back to the homestead. We both agreed that The Worumba Experience is a not-to-be-missed, never-to-be-forgotten excursion, definitely an experience I will certainly remember, and, with a little bit of luck, may have cured John of this “off-road” thing for a little while at least. We returned to camp with the sun low in the sky. What a day it had been! We’d seen some beautiful scenery, native animals, and magnificent views, had the living daylights scared out of us, and met some lovely people in Lindsay and Mary Clarke, the owners of Worumba. And to top that off, I photographed a gorgeous sunset on the way out. The next day was our last in Hawker and the Flinders Ranges. There was still so much to see but, unfortunately, it wouldn’t happen on this trip. However, 18 kilometres (11 miles) north of Hawker is Mount Little Station. There’s bush camping at Mount Little and little else apart from some more of the Flinders’ spectacular landscape and we decided on a drive to have a look. We weren’t disappointed by what we saw. The property overseer was happy to stop for a chat with us for a few minutes and directed us to some of the more scenic areas. It was a peaceful and pleasant end to our stay here. We had been told that we simply could not leave the Ranges without having dinner at the Old Ghan Restaurant and Gallery. I think it’s the only restaurant in town and the locals are quite proud of it and so we rocked up for dinner. There were only a few patrons present and the staff were particularly attentive. I wondered if it would be the same if the place had been full. In any case, the meal was good (not great but ok) and the wine from the Barossa Valley was a perfect accompaniment. But we had a long drive ahead of us the next day and so we opted for an early night. 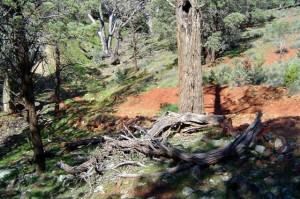 The Flinders Ranges in South Australia’s outback is stunning, spectacular, magnificent . . . one could run out of suitable adjectives. Suffice to say, I think this is where the term “wow factor” was created. But don’t just take my word for it, go see for yourself. I promise you won’t be disappointed.